Last week in the AHL’s Central Division there was plenty of action as eight teams continue their season-long battle for four playoff spots. Four games headed to overtime and 57 goals were scored from the division foes during this exciting week. The Iowa Wild (14-5-4-2) had just enough offense to remain on top of the Central Division. They averaged four goals per game in their three contests and earned three of a possible six points. The Wild spent the week at home with the first of back-to-back games against the Chicago Wolves on Wednesday night. Things got off to a great start as the Wild jumped out to a 2-0 lead before the first intermission. Justin Kloos opened the scoring just 47 seconds into the game by redirecting a Brennan Menell shot into the Chicago net. Just over three minutes later, Kloos threw the puck into the middle of the ice, while on a 3-on-2 rush, where it hit off of Luke Kunin and got in behind goaltender Max Lagace. Rookie Gerry Fitzgerald finished off a 2-on-1 rush with veteran Matt Read to extend the Iowa lead to 3-0 less than seven minutes into the second period. That would be the last high point for the Wild as things fell apart quickly. Iowa entered the game with the AHL’s top penalty kill unit, but they gave up three power play goals to cough up the lead. The first was scored just past the eight-minute mark of the second period. The Wolves cashed in on another power play just 1:40 the into third period to cut the lead to 3-2 and then tied it up 11 minutes later. The Wild headed to overtime for the seventh time in the last eight games, but they gave up a goal in the final minute to come up short. Both teams were back at the Wells Fargo Center on Friday night for the Wild’s annual Teddy Bear Toss night. The two teams put on quite the show with a back-and-forth contest and a 5-4 win for the Wild, ending Iowa’s 10-game point streak. Colton Beck scored to tie the game at 1-1 in the first period to get the teddy bears flying. Fitzgerald finished off a 2-on-1 rush to knot the game at 2-2 late in the first period, but Chicago scored in the final minute to take a 3-2 lead into the first intermission. Mitch McClain’s one-timer from the slot tied the game less than five minutes into the second period, but Chicago responded with another goal just over two minutes later. McClain netted a second goal to even things up again at 4-4 less than three minutes later. Things settled down a bit in the third period with the Wolves getting the only tally midway through the frame. The Wild got back to their winning ways with a hard-fought 5-2 victory over the Grand Rapids Griffins on Saturday night. Iowa was without leading scorer Cal O’Reilly, who was injured blocking a shot the previous night, but they responded with four players picking up multiple points. Kloos opened the scoring 3:25 into the game by beating goaltender Patrik Rybar to the glove side with a snapshot. Gerry Mayhew doubled the lead less than a minute later with a shot from the slot off a nice pass from Read. Grand Rapids got on the board late in the first period and tied the game with less than four minutes remaining in the second period. Dmitry Sokolov scored the eventual game-winning goal while on an early third-period power play. Defenseman Ryan Murphy batted the puck out of midair and it went right to the stick of Sokolov in the high slot where he rifled it home. Kunin doubled the lead less than three minutes later as a blocked shot found him all alone in the slot. Sokolov beat Rybar to the glove side for his second goal of the night at the 12-minute mark to cap off the scoring. Player of the Week: Both Justin Kloos and Colton had five points last week, but Beck’s performance versus the Griffins on Saturday night earned him the nod. The Wild needed someone to step up with O’Reilly and his team-high 18 assists out of the lineup. Beck did just that with three assists on the night. He finished the week with four helpers, which is good considering he had three in his previous 22 games. He also scored his seventh goal of the season and sits fifth on the team in scoring with 14 points. The Milwaukee Admirals (14-9-4-0) entered the week tied for first place, but after earning just one point in three games, they find themselves two points behind Iowa and just one point ahead of Grand Rapids. Before the three-game trip through Texas began, the Admirals signed defenseman Duncan Siemens to an AHL contract for the remainder of the season. He had spent the last six seasons with the Colorado Avalanche organization playing 274 AHL contests as well 16 games at the NHL level. Wednesday night’s game at the Texas Stars did not go as planned as Milwaukee had no answer for their opponent’s speed. The Admirals were in the game until the Stars scored a pair of goals about two minutes apart to put them up 4-0 late in the second period. They gave up a fifth goal before Garrett Ross scored the lone goal for Milwaukee about eight minutes into the third period. Ross had a breakaway after being released from the penalty box and scored his first goal of the year. The Admirals stumbled out of the gates in Friday night’s rematch and found themselves down 2-0 before the game was even four minutes old. Connor Brickley got Milwaukee on the board about 11 minutes into the first period by deflecting a pass from Emil Pettersson on net and putting the rebound past goaltender Landon Bow. Alex Carrier tied the game early in the second period as his wrist shot from the middle of the blue line found its way into the back of the net. Unfortunately, the Stars scored the eventual game-winning goal at the 10:59 mark and held on for the 3-2 win. Matt Donovan hit the crossbar with just one second left in the game, but the puck stayed out. Milwaukee was able to salvage a point in their final game of the road trip during Saturday’s 2-1 overtime loss at the San Antonio Rampage. The game was still scoreless heading into the third period when San Antonio finally took a 1-0 lead six and a half minutes into the frame. Milwaukee had an answer less than five minutes later when Tyler Gaudet scored from the left circle. The game headed to overtime where defenseman Fred Allard hooked Joey LaLeggia on a late breakaway. LaLeggia was awarded a penalty shot and he converted for the win. Player of the Week: The Admirals only scored four goals last week and just eight players registered a point. Emil Petterson and Alex Carrier were the only ones with multiple points. Carrier, known more for his physical play, gets the honor as he scored to tie the game at Texas on Friday night. He also picked up the primary assist on the lone goal versus San Antonio. Carrier is tied with Petterson for third on the team with eight assists. The Grand Rapids Griffins (14-8-1) continued to climb up the standings last week. After earning three points over three games, they find themselves just a single point out of second place. They now lead the division with 14 regulation and overtime wins. The Griffins won their only home game of the week on Wednesday by knocking off the San Antonio Rampage 4-2. The red-hot Filip Hronek got some puck luck to open the scoring 4:36 into the second period. His shot from the high slot was stopped by goaltender Ville Husso, but the rebound hit off a San Antonio defender and got in behind him. The Rampage responded about seven minutes later before Chris Terry gave the Griffins a 2-1 lead late in the period. A backhand goal extended his point streak to six games and tied him with Brooks Macek of the Chicago Wolves for the most goals in the AHL. Axel Holmstrom doubled the lead by redirecting a shot from Hronek past Husso 1:50 into the third period. The Rampage cut the lead to a single goal with just over four left in the game, but Colin Campbell put the game out of reach with a power-play goal in the final minute. Patrik Rybar made 25 saves for the win. The Griffins headed west for the weekend without defenseman Brian Lashoff, who was recalled by the Detroit Red Wings. Their first stop was in Rockford on Friday night for a date with the IceHogs. The game saw plenty of action with 78 combined shots on goal in a 3-2 overtime win by Rockford. The IceHogs scored first, three minutes into the second period, but the Griffins had a quick response. Just 51 seconds after the opening tally, Givani Smith camped out in front of the net and had Matthew Ford’s shot bank off him and into the net for his first goal of the season. With just over four minutes left in the third period, Matt Puempel caused a turnover behind the IceHogs’ cage. He then found Derek Hulak, who was playing in his first game for Grand Rapids, open in front where he fired the puck into the net. Dylan Sikura scored a late third-period power-play goal to force overtime. The goal ended a streak of 27 straight penalties killed off by the Griffins. Harri Sateri made one of best glove saves you will ever see to rob Jordan Schroeder on a 2-on-1 early in overtime. Unfortunately, the Griffins’ six-game winning streak came to an end when Sikura struck again late in overtime. Their nine-game point streak ended the next night against the first-place Wild in Iowa, suffering their first regulation loss since Nov. 16. The Griffins were down 2-0 just 4:19 into the game as Iowa netted a pair of goals just 54 seconds apart. Terry took over the league lead in goals when he scored at 14:30 of the first period by going to the front of the net and getting to a rebound. Puempel tied the game late in the second period by redirecting a Vili Saarijarvi shot past goaltender C.J. Motte. The Wild wasted little time in the third period as they were back up by two goals less than eight minutes into the frame. They added a fifth goal on the power play about four minutes later. Player of the Week: Chris Terry was one of the three Griffins to have a three-point week, but he was the only one to score more than one goal. With his two goals, he sits atop the AHL with 16 goals. He has at least one point in 14 of his 18 games and is well on his way to an All-Star Game appearance. The Chicago Wolves (11-10-1-4) entered the week on a five-game losing streak and outside of a playoff spot. They responded with back-to-back wins at the first place Iowa Wild before a dominating victory at the Rockford IceHogs. The six-point week has them back in fourth place. 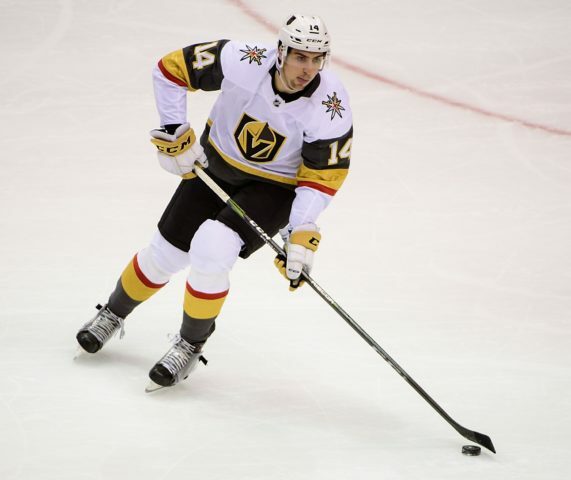 Before their week started, Reid Duke was recalled by the Vegas Golden Knights while Daniel Carr was returned to the Wolves after a brief stint in the NHL. Carr had an immediate impact during Wednesday’s come-from-behind win against the Wild. With the Wolves down 3-0 in the second period, Carr crashed the net on the power play to put home a rebound from an Erik Brannstrom shot. Defenseman Nic Hague, who was celebrating his 20th birthday, cut the lead to one with a power play goal of his own less than two minutes into the third period. Dylan Coghlan forced overtime, while on a 5-on-3 advantage, with just over seven minutes left in regulation. In the final minute of overtime, it was Hague who jumped in on the rush with Brandon Pirri and beat Kappo Kahkonen to the post. Pirri had an assist on all four Chicago goals. Friday night’s rematch in Des Moines was one of the craziest games of the season as the Wolves pulled out a 5-4 victory. Tyler Wong opened the scoring by getting to a blocked shot and firing it into the Iowa net. Wong picked up a second goal by getting to his own rebound to give the Wolves a 2-1 lead just over a minute after the Wild tied things up, the first two-goal game of his professional career. Carr fired a nifty backhand shot past Kahkonen to give the Wolves a 3-2 lead in the final minute of the opening frame. Iowa tied the game early in the second period, but Hague responded with another power-play goal just seconds after the initial faceoff on the man advantage. The Wild had another answer to even up the game at 4-4. The teams remained tied for nearly 20 minutes before Tomas Hyka’s game-winning goal at the 10:09 mark of the third period. Hyka redirected a Keegan Kolesar shot past Kahkonen for his third AHL goal on the season. The Wolves stopped in Rockford on their way back home to take on the IceHogs Saturday night. 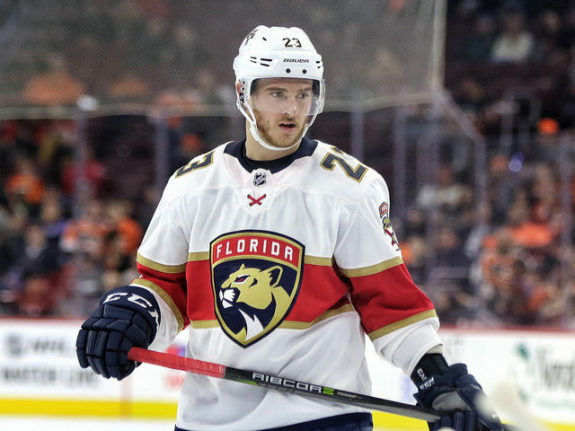 The road team had won the first three games of the series and that trend continued as Pirri came back to bite the hand that once fed him in a 4-0 win. Pirri, who is the only player in IceHogs franchise history to score 200 points, opened the scoring 2:47 into the game by faking a pass on a 2-on-1 and firing the puck over the glove of goaltender Colin Delia. Pirri doubled the lead about 11 minutes later while on the power play. The goal extended the Wolves streak to five straight games with a power play goal and ended the IceHogs’ streak of 17 straight penalties killed. Hague continued his hot play less than two minutes later when he scored his fourth goal of the week by skating around a sprawled-out defender and lifting the puck over the left pad of Delia. Pirri earned his hat trick late in the second period by following up his own shot and putting the rebound home. Oscar Dansk made 32 saves for his and the team’s first shutout of the season. This was the fourth time in franchise history that the Wolves scored a hat trick and earned a shutout in the same game and the first time since 2006. The Wolves announced on Monday that Duke will be returning from Vegas and will rejoin the team for this week’s action. He did not crack the lineup during his time with the Golden Knights. Player of the Week: The Wolves had some huge performances last week. Carr had two goals and six points, T.J. Tynan picked up four assists and Hague scored four goals. However, nobody was hotter than Pirri, who finished the week with three goals and eight points. He now has at least one point in 20 of 25 games this season. He leads the AHL in points (34), assists (21) and shots (103). The Rockford IceHogs (11-10-1-4) have fallen down to fifth place after they split a pair of home games. Just like the previous week, the IceHogs were shutout in one game and won the only game they were able to score in. Funny how that works. The IceHogs began their weekend by hosting the Grand Rapids Griffins in a fast-paced and exciting 3-2 overtime victory. Nathan Noel, who has been one of the most effective IceHogs forwards of late, was finally rewarded with his first goal of the season early in the second period. Noel drove hard to the net and was able to sweep the puck over the goal line to give the IceHogs a 1-0 lead. The Griffins got a puck to change directions in front of Anton Forsberg to tie the game less than a minute later. A turnover behind the net led to the visitors grabbing a 2-1 lead with just over four minutes remaining in regulation. Enter Dylan Sikura. On a power play, Sikura tied the game with just 2:58 remaining. He received a pass in the neutral zone from Jordan Schroeder and skated uncontested up the middle to beat Harri Sateri for his eighth goal of the year. He would strike again in the final minute of overtime for the game-winner. Sikura headed straight for the net where he was able to deflect Joni Tuulola’s shot from the point into the back of the net. Forsberg made a season-high 41 saves in the victory. Before Saturday’s game with the Chicago Wolves, the team announced that they released forward Justin Auger from his professional tryout contract (PTO). He had two goals in nine games for the IceHogs. 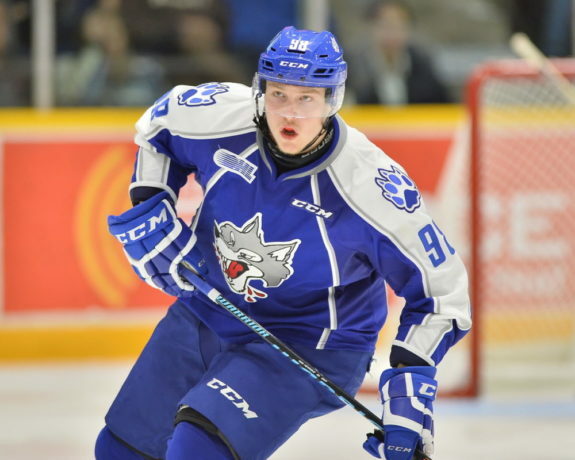 Auger was not out of work very long as he signed a PTO with the Belleville Senators on Monday. The game later that evening did not go so well as the IceHogs were shutout for a second straight Saturday on home ice. They fell behind 3-0 by the first intermission before former IceHog Brandon Pirri finished off his hat trick in the third period. The IceHogs had plenty of quality scoring chances, especially in the final frame, but they could not solve Oscar Dansk. They might have lost by at least seven goals if it wasn’t for the efforts of goaltender Colin Delia, who made 35 saves. 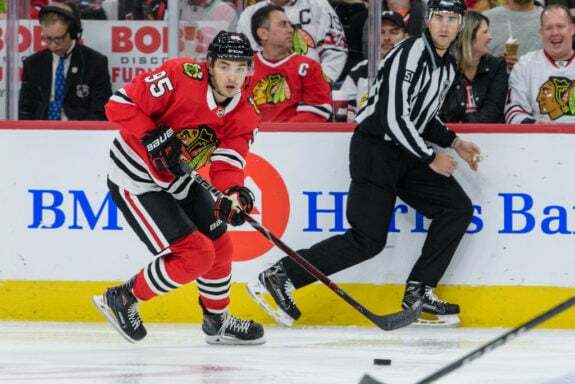 Player of the Week: This was a relatively easy choice as the IceHogs would have lost both games last week if it wasn’t for the heroics of Dylan Sikura. He leads the team in goals (9) and points (18). His 90 shots on goal are the second-most in the AHL. His skill set and stats have Chicago Blackhawks fans clamoring to see him in the NHL. The Texas Stars (12-9-1-1) continued their offensive surge during their two wins over the Milwaukee Admirals last week. They have now won five of their last six games and are just three points out of the fourth and final playoff spot in the Central. The Stars got a great performance from some of their top point producers as well as goaltender Landon Bow in their 5-1 win over the Admirals on Wednesday. Denis Gurianov used his speed to break past the defense and beat Tom McCollum between the legs to open the scoring at 13:24 of the first period. Joel L’Esperance doubled the lead with his first of two goals while on an early second-period power play. They put the game out of reach with a pair of quick goals late in the frame. The first came when Colin Markinson finished off a 2-on-1 for his second goal of the season. Just over two minutes later, L’Esperance struck again on another breakaway. He now leads all AHL rookies with 12 goals. Adam Mascherin, who had the primary assist on L’Eperance’s second goal, was credited with the team’s fifth goal early in the third period. He blasted a one-timer from the right side and the rebound was accidentally knocked in by Milwaukee defenseman Joonas Lyytinen. Low made 29 saves, including 11 in the third period, for his eighth win of the year. The only blemish came on a late third- period breakaway. 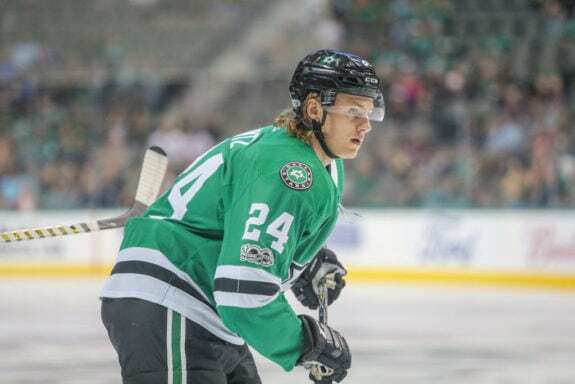 Before Friday’s rematch with the Admirals, Roope Hintz was reassigned to the Stars after a stint in the NHL and he would play a big role in the team’s 3-2 win. The Stars wasted no time as they built a 2-0 lead just 3:45 into the game. Justin Dowling opened the scoring by redirecting a pass from Gurianov into the Admirals net. Two minutes later, an odd-man rush led to Niklas Hansson being wide open in the left corner for an easy goal into an empty net as goaltender Troy Grosenick was caught out of position. The Admirals got back in the game after calling their timeout. They cut the lead in half midway through the first period before getting even early in the middle frame. The Stars responded with heavy pressure and Hintz scored the eventual game-winning goal with nine minutes left in the second period. The goal extended his AHL goal streak to four games dating back to Nov. 11. Milwaukee had several chances during the third period, but could not score the equalizer. Player of the Week: While the Stars offense has been humming, goaltender Landon Bow has been playing his best hockey as well. Low stopped 60 of the 63 shots he faced last week for a .952 save percentage (save %). After struggling a bit to start the season, Low has his save % up to .904 and is tied for second in the AHL with 9 wins. The Manitoba Moose (11-12-2-0) wrapped up their two-week trip through California by picking up three of a possible six points in Bakersfield and Stockton. They will head back home still in seventh place, but only five points out of a playoff spot. Logan Shaw has been an amazing pickup for the Moose. While they are still near the bottom of the division, without Shaw things would be much worse. After the Moose fell behind the Bakersfield Condors 2-0 on Wednesday night, Shaw finally scored the team’s first goal of the two-game series early in the second period. Logan Stanley’s shot from the point was deflected by Michael Spacek right to Shaw who fired it into the open cage. The Condors scored two more goals before the end of the frame to take a 4-1 lead, but Shaw had a late answer just before the second intermission. This time, Jansen Harkins won a puck battle and found Shaw out in front of the net for his second goal of the night. He went on to complete his second hattrick in the last four games midway through the third period with a wicked slap shot, but the Moose could not draw any closer. The road trip then moved on to Stockton Friday night for its final two games against the Heat. The Moose benefitted from a pair of early Stockton penalties. They cashed in on their second power play just 2:46 into the game. Stanley blasted a slap shot past Jon Gillies for his second goal of the season with the helpers coming from Shaw and Spacek. C.J. Suess’ seventh goal of the year doubled the lead in the final minute of the first period. Goaltender Eric Comrie needed to be a monster in the second period as he stopped all 20 shots he faced in the middle frame and he had to stop two breakaway attempts by Glenn Gawdin. The Moose taking five penalties during the period had a lot to do with the Heat’s high shot total. Stockton continued to press in the third period and finally got one past Comrie about five minutes in after a bad offensive zone turnover. Comrie kept the Moose ahead by stopping 14 shots in the third period and finishing the night with 41 saves; the most he has made this season. The two squads were back on the ice for the rematch on Saturday night. After giving 42 shots to Stockton the night before, backup goaltender Mikhail Berdin had to face 46 shots in a 3-2 overtime loss. He stopped all 14 shots during the opening 20 minutes to send the game to the locker rooms tied at zero. The goal judges had a busy second period as the frame produced four of the night’s five goals. After giving up an early shorthanded goal, Seuss answered with a power-play goal by firing home a feed from Spacek. The Heat regained the lead 13 minutes into the period, but Josh Healey gave the Moose five minutes of power play time after getting a major for elbowing. Alexis D’Aoust cashed in by getting to a rebound and snapping into the Stockton net. Both teams had plenty of chances to grab the lead during the third period, but they needed overtime to decide who gets the extra point. The 3v3 period provided plenty of excitement and 10 combined shots. Curtis Lazar scored his second goal of the night to win it for the home team just 18 seconds away from a shootout. The Moose will now return home for six straight games at Bell MTS Place. In fact, 12 of their next 15 games will be on home ice, so if they are ever going to gain ground in the division the next five weeks are when they are going to do it. Player of the Week: Logan Shaw was in the running for a second straight week with his hat trick on Wednesday, but he only picked up one assist the rest of the week. Michael Spacek had assists on all three Shaw goals and then grabbed another helper in each game in Stockton to finish the week with five assists. Spacek only has one goal on the year, but he leads the team with 14 assists. The San Antonio Rampage (10-15-1-0) cooled off a bit this past week. They split their two games after winning six of their previous games. They remain in eighth place but are just three points from crawling out of the cellar in the Central. The Rampage started their week on Wednesday after a four-game road trip in Grand Rapids that began the previous week. For the second time in six days, they were dropped by the Griffins, this time 4-2. San Antonio fell behind 1-0 when a rebound hit defenseman Niko Mikkola and bounced back into his own net early in the second period. They drew even a few minutes later when Nikita Soshnikov found Nolan Stevens in the slot where he fired a quick shot into the Grand Rapids net. The Griffins would retake the lead before the second intermission. Grand Rapids extended their lead to 3-1 early in the third period. Tyler Wotherspoon, who had the secondary assist on the first goal, cut the lead in half at 15:43 with a shot from the top of the left circle. This was his first multi-point game of the season. The Griffins iced the game with a power-play goal in the final minute. The Rampage returned to San Antonio on Saturday for their first game on home ice in December. They battled the Milwaukee Admirals for two scoreless periods before captain Trevor Smith scored at 6:32 of the third period. Smith, who missed the last eight games due to injury, won a foot-race to a loose puck and slid it into the Admirals net. The Admirals tied the game less than five minutes later to force overtime. Late in the extra frame, defenseman Joey LaLeggia got in behind the defense and was hooked by Frederic Allard on his way to the net. The officials awarded LaLeggia with a penalty shot which he converted between the legs of Troy Grosenick for the Rampage’s first overtime win of the year. Not every day you see a game-winner like Saturday's. Relive @joeylaleggia's overtime penalty-shot winner again…and again. Player of the Week: Veteran goaltender Jordan Binnington stepped up for the Rampage to get them back in the win column on Saturday night. He made 31 saves en route to this eighth win of the season. Eighty percent of the team’s wins this season have come with Binnington in net. 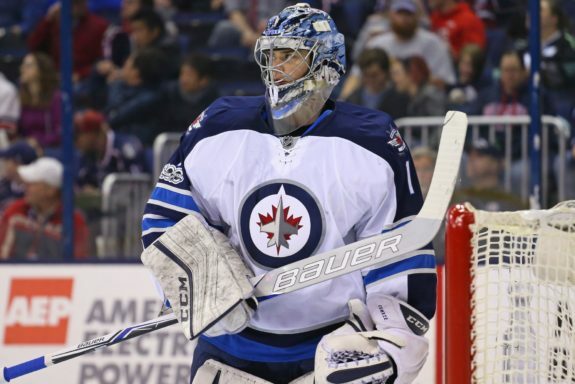 His goals-against average (GAA) is down to 2.34 which ranks fifth among all AHL goaltenders. He was rewarded for his play by being recalled by the St. Louis Blues on Sunday.